Baker's Dozen: A Batch of Sweet Crumb Cake Links! Woot! It's friday. Let's celebrate with a baker's dozen of sweet links centered around a delicious treat that ought to be considered its own scrumptious food group, Crumb Cake. Colossal. Crumb. Cake. (pictured above) Alas, no recipe to share, but let's all swoon at the pictures and description just one more time. On Baking Bites, an adaptation of a Martha Stewart Recipe for "Lots of Crumb Cake" that looks pretty delicious. For traditional New York recipes, I always depend on The Food Maven, Arthur Schwartz (after all he's the one who introduced me to Nessolrode Pie!) 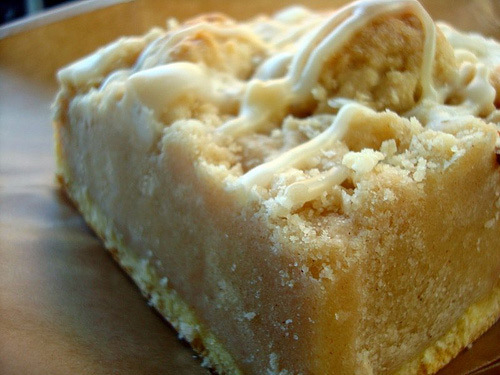 - so it would stand to reason that his NY Crumb Cake Recipe is worth a try. Because cardamom is like a kiss on top of crumb cake: cardamom crumb cake via Food and Wine. If you want more lore along with some sweet recipes, check out Barry Popik's research on crumb cake. Entenmann's has nothing on Cook's Illustrated: The baker on this site tried out the Cook's Illustrated recipe for NY Crumb Cake, and had delicious results. A new classic: Big Crumb Coffee Cake with rhubarb, via Smitten Kitchen. Chocolate Crumb Cake: Crumb cake is awesome, but My Baking Adventures proves that it can get awesomer. Pumpkin crumb cake: Sounds like heaven. And it's vegan too! Crumb cake with a cake mix: You may balk at the idea of a cake mix, but look at that crumb to take ratio. Incredible. Brown Sugar Plum Crumb Cake: Don't fret about the fruit, it doesn't taste even vaguely healthy. Peanut Butter and Jelly Crumb Cake: It has the power to make you wish you were going back to school. Happily, if you're all grown up you can call in sick and make (and eat) this cake all day.